The 9th UCF Ethics Bowl will be held on Sunday, October 21, 2012, at 9 am in the Teaching Academy Building at UCF. An Information Meeting will be held on Tuesday, September 11 & 18, at 6:00 pm in the Department of Philosophy, PSY 226. For participation information (as a team, moderator or judge) please contact Michael Strawser at michael.strawser@ucf.edu. UCF has participated in all of the Southeast Regional Ethics Bowl (SEREB) Competitions (since 2004, the first year of the SEREB) that are held in St. Petersburg, FL. As part of our Core Commitments projects, we have created a local UCF Ethics Bowl competition using the cases published by the Association for Practical and Professional Ethics. Check out the FAQs page for more info. We hope to hear from you soon! If you have general questions about the ethics bowl, post them here and we will answer them in the Ethics Bowl FAQ page for everyone to see. If you have specific information requirements or requests, contact either Michael Strawser (michael.strawser@ucf.edu) or Nancy Stanlick (nancy.stanlick@ucf.edu) at the Department of Philosophy. Because of a surge in interest in the ethics bowl, and because there are still a couple of spaces left for teams, the deadline for registration is extended to February 8. Please scroll down this page for further information and for the registration form. There is no registration fee. The form is simply for information for organizational purposes. One important change has been made. The entire competition will take place on March 22, 2008. It is impossible to get the rooms we need on campus on March 29. Team check-in and plenary meeting to review rules and procedures and distribute room/round assignments will take place between 8:00 a.m. and 8:45 a.m. Initial rounds run from 9:00 a.m. to noon. Lunch is from noon-12:50 p.m.
Quarter finals, semi-finals, and finals begin at approximately 1:15 p.m. Closing events (awards, acknowledgements, etc.) occur immediately after the final round. A full schedule with exact times and locations will appear here within the next few weeks, and prior to March 15. Originally Posted on March 11, 2008: Final planning for the ethics bowl competition on March 22nd is nearing completion. Here is a copy of our announcement (see https://ucfcorecommitments.files.wordpress.com/2008/03/ethbowlannouncement.jpg). If you see this and would like to forward the information on to others who may want to watch UCF students compete in this event, please do so. We’d really appreciate it. Originally posted on January 4, 2008. Moved to this page on 3/24/08. A link appears below to an Ethics Bowl Video from the National Collegiate Ethics Bowl. This is a very large file and it will take quite a while to load, depending on your connection speed. It is approximately 9 min, 45 sec long. Go to http://reach.ucf.edu/~phi2010c/2003EthicsBowl.mpg. Use this link to review the UCF Ethics Bowl Rules and Procedures. Use this link to review the Scoring Sheet for Ethics Bowl Competitions. by Robert Slade (UCF Civil Engineering major/UCF Burnett Honors College) in the summer term 2007. Go to https://ucfcorecommitments.files.wordpress.com/2008/01/ucfethicsbowlspr2008cases.pdf to see the cases. 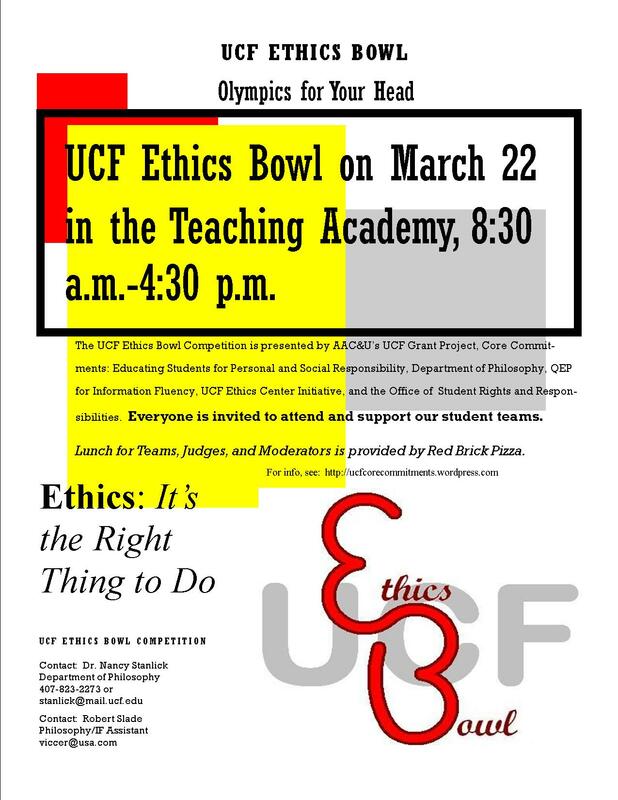 This is the link to the scoring sheet: https://ucfcorecommitments.wordpress.com/2008/01/04/ucf-ethics-bowl-cases-for-on-campus-competitions-in-march-2008/scoring-sheet-for-ethics-bowl-competitions/.